A running game normally occurs only when both sides have succeeded early in advancing their runners to safe outposts. The chances of hitting blots, or of blocking enemy men have been considerably reduced as a result. A running game is the only type of game where the dice have a decisive say in the outcome. 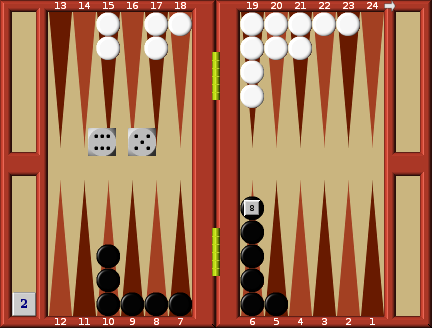 The player getting the higher numbers (provided he makes no movement errors) is normally the winner. Open your board, set up your men, and follow this illustrative example running game. White wins the opening move and plays 3:1 to make his 5 point, with the intention of building up a blockade. Black throws 6:5 and promptly runs with his runner 24-13 to produce the situation in diagram. White now throws 5:1 and plays 12-17, 19-20. Note how White has a spare man positioned on each point, 17, 19 and 20. This gives him a very high probability of making yet another blocking point on his next turn. 6:1 would make the bar point, and he would make the 4 point with 4:1, 4:2 or 2:1, etc. From Black's viewpoint the position has deteriorated: he has made no progress in building a blockade, and his remaining runner is rapidly being hemmed into White's home board. Black throws and gets 6:3 and in view of the threatening shape of White's board decides to run, moving 24-15. 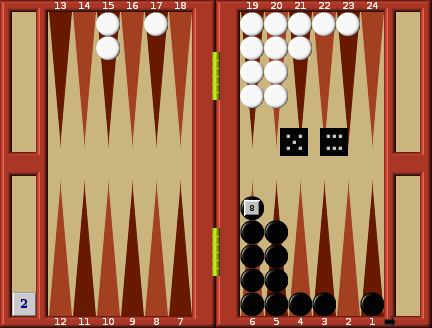 Very annoying for White; his promising blockade is quite useless unless he can hit a blot blot and force it back into his home board, so mentally praying for a 3 he throws his dice and gets 6:6 and makes the classic move, two men 1-7 and two men 12-18 to make both bar points, thus producing the situation	in diagram. For Black the situation is not good. 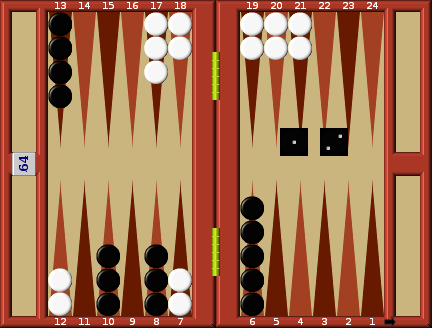 His blot on 15 has survived, but the chances of getting it to safety are not very good; if White hits it on the next turn he would be in a position either to double Black, or possibly even to gammon him. Black realises that his only hope is to play a safe running game, throws his dice and gets 5:3. With a sigh of relief he makes his 10 point,	moving 15-10, 13-10. This will provide a very badly needed safe landing-point for the men coming home from the 13 point. White now throws 2:1 and moves 19-21, 20-21 to make his 4 point. 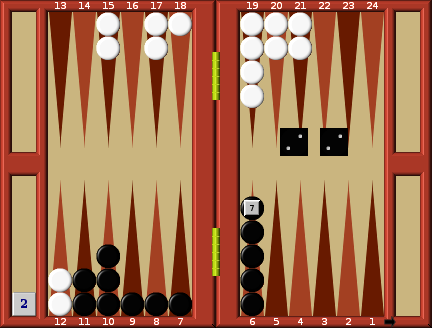 Black also throws 2:1 and plays 13-10 to produce the situation in diagram. White surveying the scene realises that the chances of hitting a black blot have almost gone, and his superb blockade is now virtually useless to him, so there is no longer any great advantage in leaving his two runners on 7. It is not easy for White to run for home, and the difficulty is to get his two men on 7 clear without exposing a shot to Black. Undecided, he throws his dice and gets double 4. Now he must decide, run or stay in the hope of a shot at Black? 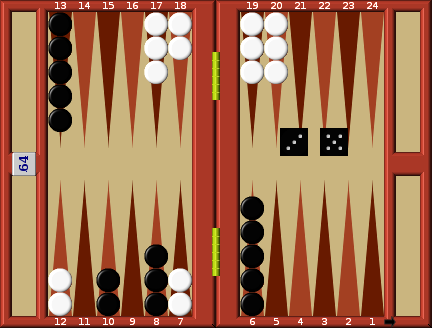 Sometimes it is quite obviously simple to make such a decision when one side is clearly in the lead, but it is by no means clear who is in the lead, so White decides to make an accurate count of the position. For a moment we break off the running game and explain how to count the position. The count represents the number of points you would have to move (assuming no wasted motion), to move your men into the home board and bear them all off. The count of each man in your home and outer boards is that of the point he is on. A man on your 6 point counts 6, a man on your 8 point counts 8, etc. The count for your men on your opponent's board starts	at 13 for his 12 point, 14 for his 11 point, and so on to 24 for his 1 point. 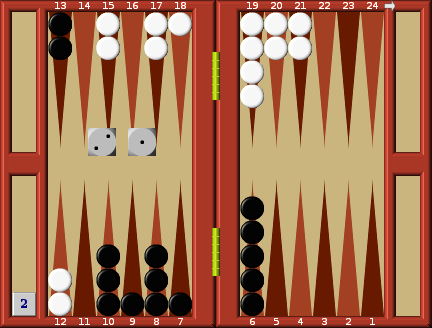 Look at diagram and count the position for both Black and White. White finds that he is in the lead by 6 points, or about 5%. This is not much of a lead, as he would normally like to see an 8 to 10% lead before deciding to make a run for it. However in this case there is not much alternative; if he stays there is little likelihood of Black exposing a blot. If White now deducts the value of his current throw from his count, he finds that after he has made his move his count will be 114, giving him a lead of 22 points. 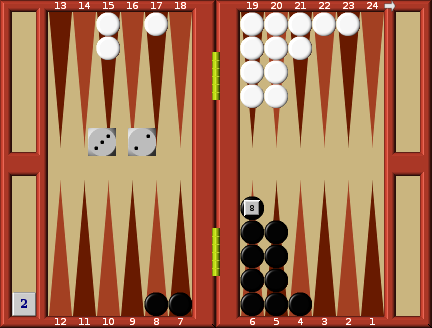 The average throw of the dice is 8 1/6 (after making allowance for the doubles) so that a lead of 22 represents almost three turns. He hesitates no longer and decides to run, moving his two men 7-15. 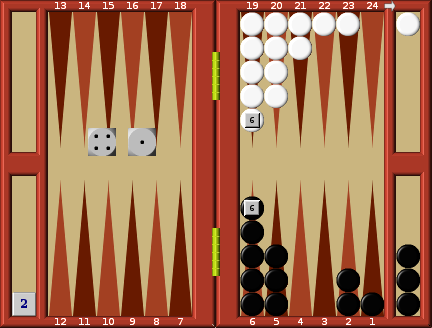 Black, who has virtually been forced to play a running game after his opening move, now finds that he is falling behind White, and worse still, if he does not throw big dice on his next turn he can expect White to double him. Again we must pause in the running game to examine the best method of movement in the running game stage. 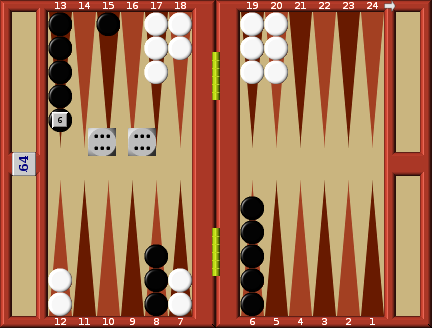 Most games end up in a race for the home board once contact is broken off, and it is vital to be familiar with the correct methods of movement in this situation. Every move must be utilised to its utmost, do not waste a single point. Your first objective is to get all your men into your home board as fast as possible. You aim to get the on your 6 point. This may well give you a very distribution with a huge pile on the 6 point, but by doing this you will find that you start getting the first man the board quicker than if you used the points to mo them further into the home board. High throws should not be used to move men from outer board to low points in your home board if you have men further away. Use them to bring in the most distant men. If you still have men on your opponent's outer board, bring them down to your outer board first, where they are within reach of your home board with the throw of one die, rather than requiring two dice to get them in. 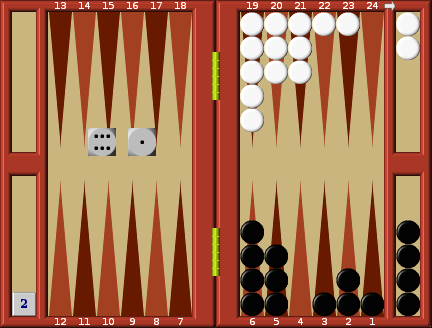 If possible each move should make a man change boards (i.e. from your opponent's outer board to your outer board, or from your outer board to your inner board) and should not be used to move within the same board. As you move into your home board try and place your men on open points (so long as it does not waste a part of your move) to help you bear off one man with each die you throw. When all your men are in the home board (no matter how badly distributed), remove a man if it is possible rather than move within the board. Now we can resume the game. Black throws 6:4, and plays 13-7, 13-9. The count is now White, 114; Black, 126. White is in the lead by 12 points, and it is his turn to play next. 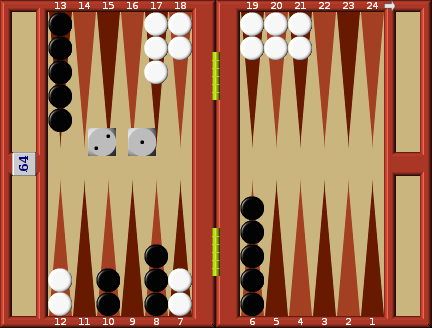 A 10% lead in a running game is sufficient for a double, so before throwing his dice White doubles Black. So long as Black is not more than 15% behind he should accept the double. 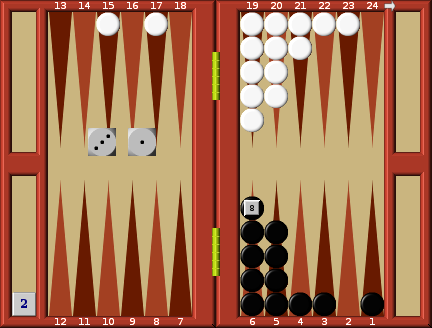 The game proceeds and White throws 2:1 (now he wishes he had not doubled!) 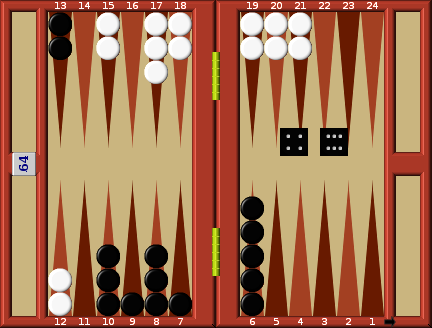 But for Black's two men on 13 he would use this throw to bring his two men on 12 down to his outer board, so in this case he plays 17-19, 18-19. Note that he does not waste a single point: both men change boards, and he moves men that exactly reach his 6 point. Black now throws 2:2. He changes boards with his two most distant men, moving two men 13-11, and moves two men 8-6, so that not a point is wasted. White in his turn throws 6:4 and brings down the two last men from 12 to 16 and 18. Black throws 6:5 and correctly brings in his two most distant men moving 11-5, 11-6. White throws 6:5, and here he makes an error. The correct play would be to bring in his two most distant men, moving 15-21, 15-20. Instead he decides to	fill in vacant points on his home board (desirable, but this should not be done at the expense of moving his two most distant men) and plays 16-23,	and 16-22. White has wasted points that may well cost him the game if his next two throws are low ones. Black throws 5:5, and correctly moves his most distant men, Playing three men 10-5, and one man 9-4. White throws 3:2, and, in his desire not to collect too many men on his 6 point, again makes an error by moving 17-20, 18-20. His correct play is to	move both men on 17 to 20 and 19 to get minimum waste movement. Black now throws 6:5, avoids the error of moving both men onto 2 and instead fills in two vacant points by playing 7-1, 8-3. White throws 3:1. Now his errors have caught him out. Instead of getting two men into his home board he can only move one man in, and this time correctly moves the most distant man 15-19. At this stage Black contemplates a re-double, but decides that in view of the fact that he has so many men on his 6 and 5 points it would be wise to wait another turn or two. 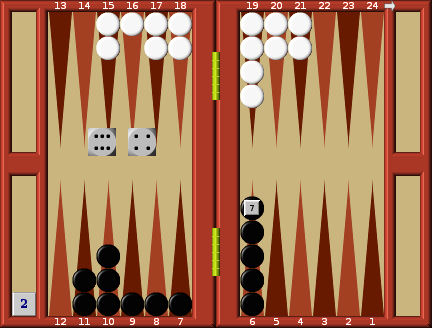 In view of the bad distribution in his home board, Black still hesitates to double, throws his dice and gets 4:4. He removes one man from 4, moves one man 5-1 to fill the 1 point, and takes two men from 6 down to 2 to improve the distribution in his home board. White throws 4:1, moves the last man: 18-19 and removes one man from 21. Black throws 6:3, removes one man from his 6 point and another down 6-3. White throws 6:1, removes a man from his 6 point and plays the one by moving 20-21. Again we must halt the game a moment and discuss judgement of the position during the end game. At this stage the point count method of judging the position	ceases to have any use. If for example White had only one man left on 6 his point count would be 6. If Black had five men left on his 1 point his point count would be only 5. 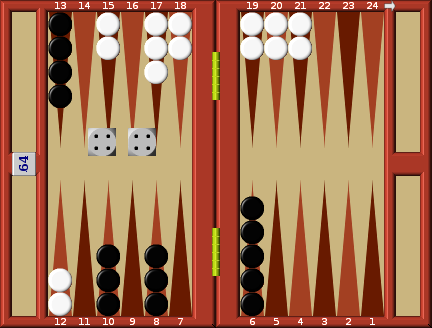 Excluding a lucky double it is going to take Black three turns to remove all his men from the board (two with each throw of the dice), whereas White is bound to remove his remaining man in two throws or less. Therefore in the end game it is not points that count, but rather the number of turns required to remove all your men from the board, assuming two men off with each throw of the dice. 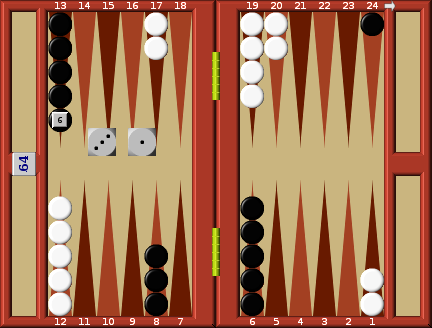 Black has four men off the board, and White has two men off, leaving Black with eleven men on the board and White with thirteen. Black would need 5 1/2 turns to get off, White 6 1/2. 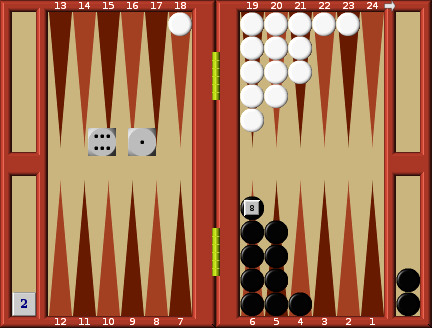 Had he been 2 turns ahead Black would have doubled instantly, but with the gaps in the middle of the board he decides to await	the outcome of the next throw. Black throws 6:1, and removes men from the 6 and 1 points. White throws 5:1, he moves one man from the 6 point to the one point and then takes the same man off the board. Black now has nine men left on the board, White has 12. 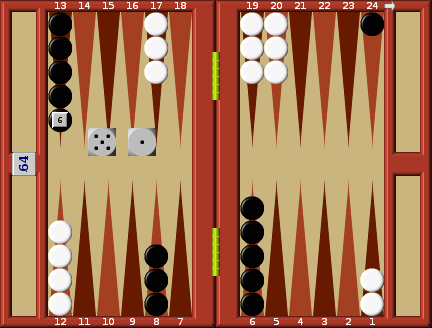 After the next throw of the dice Black will, with a little luck, be four men ahead of White, so he now offers White a re-double to 4, to force him to retire. 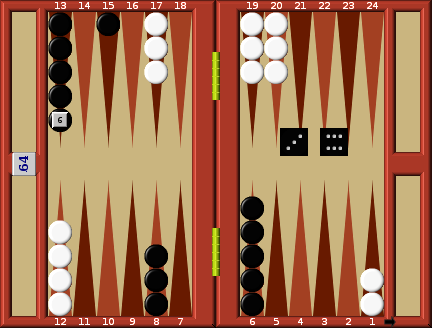 Black, being ahead, does not want to risk White throwing some high doubles to catch up. White refuses the double. In this sort of situation you	do not accept doubles where you must throw a high double to win. 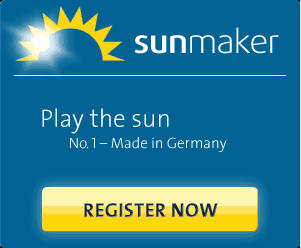 The odds are too much against you. With White refusing the double the game comes to an end.